It is mid-May. Our friends in the plains share their woes about the rising temperature. We are fortunate to be in the hills. It is warm, vivid and green. Full of summer fruits and flowers and frolicking birds. Yesterday, it was bright. It was breezy and by mid-afternoon clouds appeared and started moving, rolling and rearranging themselves in fascinating and sometimes grotesque patterns on the blue canvass. Winds roared and howled and thunderclap deafened the world. The drama ended in the rain sprinkling on the grass, in the garden, and in the valley. The shower was soothing, the gust of cool air delighting, petrichor so intoxicating and elevating the senses to another level. There is something magical about rain. It nourishes the Earth and also the soul. We sat in our verandah, soaking in the beauty and freshness that comes after a good downpour. 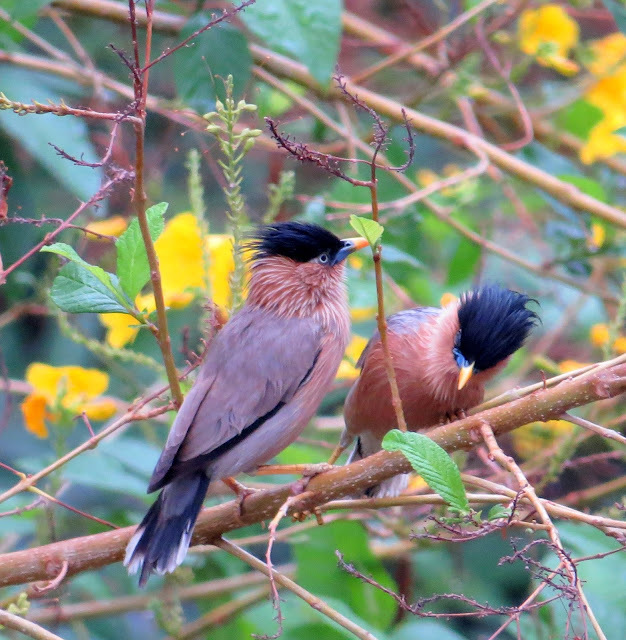 We spotted a pair of Brahminy Starling perched in the lower branches of the Yellow Trumpet tree. The evening was windy and cold. 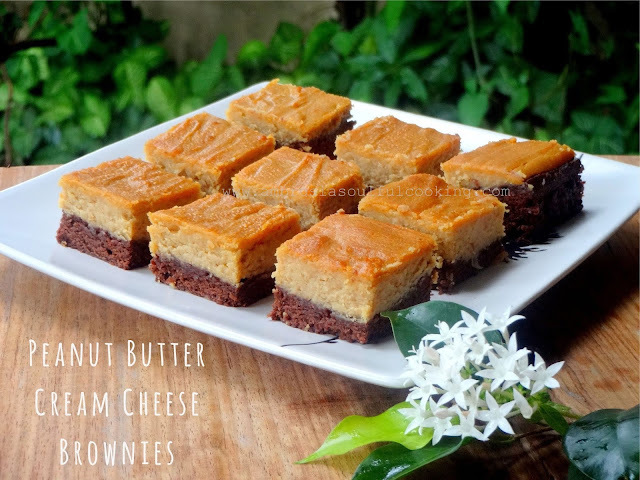 We enjoyed steaming tea with Peanut Butter Cream Cheese Brownies. Peanut butter was homemade. Living in a small place has its own limitations. We do not get cream cheese in the stores here. We made cream cheese at home. If you wish to make cream cheese at home, follow my recipe given at the end of the post. It was a pleasure to bake whole grain brownie. 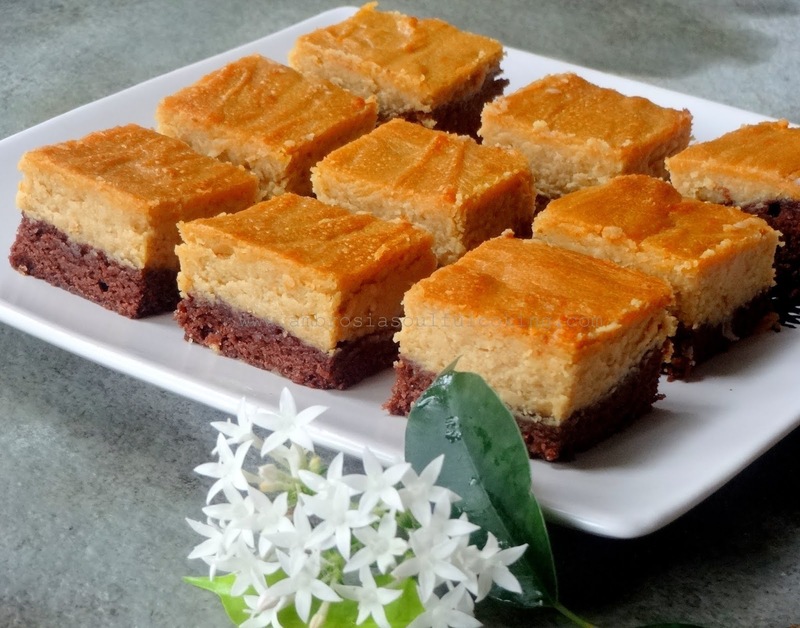 We loved the gooey chocolaty Peanut Butter Cream Cheese Brownies. Grease and line one 8x8 inch square cake pan. In a large bowl, take cream cheese, peanut butter, honey, vanilla extract and salt. Blend well to get a smooth and uniform mixture. Add egg and blend. Keep aside. To prepare brownie base, whisk together whole wheat flour, baking powder, cocoa powder and salt. In another bowl, beat butter and sugar. Add yogurt and vanilla extract and mix well. Add egg and mix till well blended. Mix dry and liquid ingredients of brownie base till combined. Spread brownie batter in the pan. Level with a spoon. 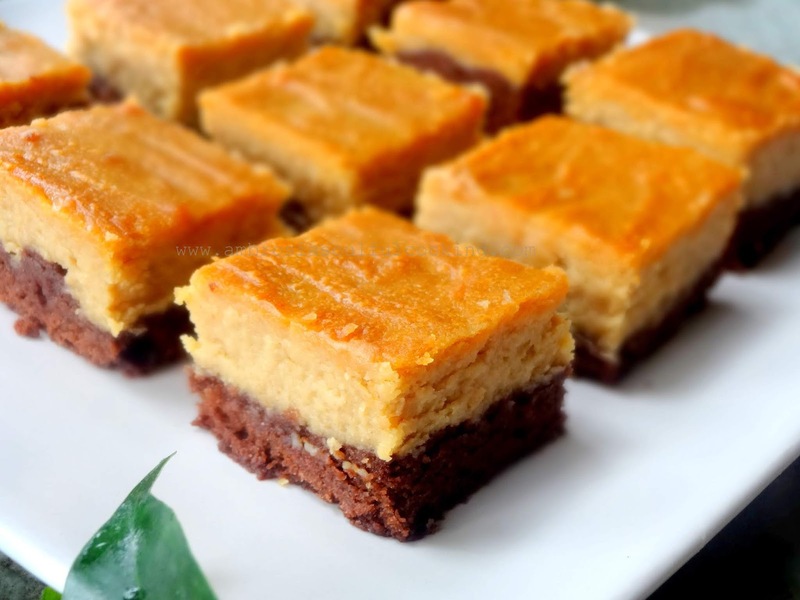 Pour peanut butter cream cheese layer on top of the brownie base and spread evenly with the back of a spoon. Level the top. Bake for 15 to 20 minutes. The center should be firm to touch. Remove from the oven and cool. Refrigerate for 4 to 5 hours. Dice cottage cheese into small pieces. Blend to a smooth paste. Add curd. Blend again till you get a creamy mixture. Line a strainer with a cheesecloth. Place it on a wide-mouthed bowl. Empty the mixture into the lined strainer. Bring the edges of the cheesecloth together. Tie a knot. Cover and keep it in the refrigerator for about 24 hours. Discard the water collected in the bowl. Transfer cream cheese to a container and use. I am a long time reader of your blog. I love your posts also for the bit of hillside and nature you present to us. I have tried your recipes and have loved them.